Many times I have been asked how progress-focused principles and techniques might be used in conversations with one's manager. Managers sometimes do things which are unhelpful or problematic for employees, such as making unrealistic demands, being unclear in their expectations, being passive, and being unsupportive. When the working relationship between managers and subordinates is good subordinates can openly discuss what is bothering them and the two of them can work out some kind of solution for the problem. It may be the case, however, that managers are not so open and constructive. In these cases it is probably wise to be very conscious of the hierarchical relationship and to prepare your conversation with the manager well. I have made a simple taxonomy of situations to help prepare for such conversations (see figure below). Reactive strategies are useful when managers do things which are somehow problematic for their subordinates. When a manager makes a demand or request which is unrealistic or which seriously conflicts with something which is important for you as a subordinate you may use the technique of the positive no. This approach, first formulated by William Ury, helps to be clear about your no while making it likely that the relationship will remain good. What makes this approach effective is that in addition to saying no you provide a specific reason for your no in terms of your interest and you formulate an alternative possibility (read more here). When managers lack clarity in the way they have tried to direct you it can be helpful to start asking them some questions. First, you may prepare by trying to list what you do and do not understand about what they are expecting from you. Three dimensions of performance which you may use in your preparation and discussion are: (1) What? What behaviors or results are you expect to show? ; (2) Why? What are the reasons you should do this? ; (3) How? To what extent are you autonomous in how you do this? The more specific you and your manager can talk about these things the more helpful this may be. Chances are, you will not be the only one who is helped by the conversation. By asking these questions employees may help managers to gain more clarity themselves. Needless to say, this approach will probably work best if done in an appreciative and non-threatening way. In order to do this, you may start the conversation by explaining how it might help you, for example by saying something like: "It would really help me to understand better how I can contribute most effectively to the team. So can I ask you a few things about that?" Proactive strategies are useful when managers don't do things they are supposed to do. Take for example a situation in which a manager does not act or does not act effectively when there is a problem in the team. If you do feel that you know what the manager should have done in the situation it might be a good idea to suggest this to him or her. Probably the best way to do this is in a one-on-one conversation in a way that is as constructive and non-threatening as possible, while fully acknowledging the manager's perspective. For example you might say: "I have thought about problem X in our team and I came up with an idea that might be helpful. Could I share it with you?" When the manager has agreed you might say something like: "I think it would be a good idea if you, as our team manager, would (1). I think that would be helpful because (2). Do you think that is good idea?" In this sentence (1) stands for what you suggest the manager should do and (2) stands for what you think the positive effect of that behavior would be. Another legitimate reason for trying to influence your manager is when he or she does not take your interest into account well enough. Examples of this kind of problematic management behavior are: not providing enough autonomy in your work role, not involving you in decisions that affect you, and not helping or mentoring you. In order to remain motivated for your work and committed to your organization you can take the initiative to talk to your manager. 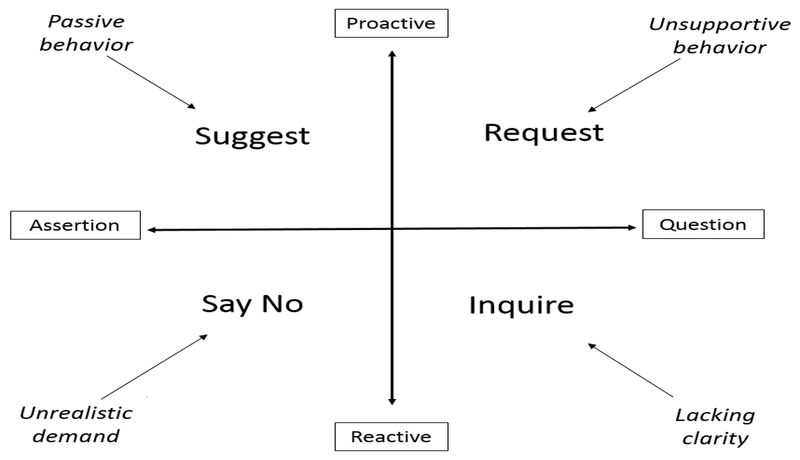 Again, you can use the what-why-how sequence to prepare and conduct the conversation. Before the conversation think carefully (1) what it is you need from your manager, (2) how that would help (both in terms of your individual benefits and organizational benefits) and (3) how your manager might supply what you need. For example, a client of mine felt demotivated by how his manager, in his eyes, was overly negative in his feedback on his performance. He thought about this and asked his manager: "I have noticed that I work best when I have a clear sense of what I am doing that works well in my job. Could you help me to get clearer picture of that by asking me what goes right in my job? The manager did what was asked of him and a pleasant and useful conversation emerged. Question: Do you find these ideas useful? Let me know what you think.